« Tips to get those UFO’s (UnFinished Objects & Projects) DONE! This post is about how to sort your UFO’s- but let me tell you a little about the inspiration… This past Sunday, it was 72 degrees- it’s February and I live in NJ, folks! Crazy! We went for a long walk at the park with Alfie, and then treated ourselves to ice cream afterwards. It’s feeling like Spring (though I’m sure that will only last another day or 2… then we’ll most likely get a seasonable arctic blast.) But while it’s warm and the sun is shining, it’s certainly putting me in a good mood. A SPRING mood. What does that mean? Lately, it makes me feel like doing some purging around the house. So much stuff to get rid of! While we were going through the dresser drawers, I came across a UFO (UnFinished Object) that I’d forgotten about- a small quilt which was almost done except that it needed ONE border sewn on. And that one border was already pinned on! Seriously- I had left it unfinished with just ONE seam left to do. Whaaaaaat? What is wrong with me, I asked myself- why could I NOT just finish the thing? Why was it shoved in a drawer and abandoned for a few years? And then I remembered the details of the project. A guild had asked me to work up a special project to teach them at a workshop. I did so, and I was almost done the sample, when they cancelled. I was left feeling aggravated that I’d wasted my time on this. I didn’t even LIKE the project! So, I had stashed it away where I didn’t have to see it, and didn’t have to be reminded of the aggravation it had caused me. So, let’s talk about unfinished objects and projects and other “stuff” in our lives that are just hanging around. 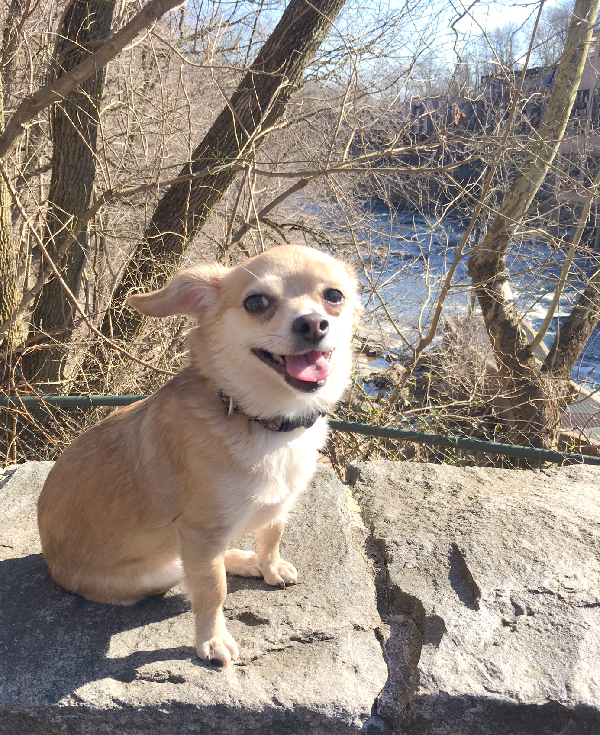 Have you heard the analogy about the river and the reservoir? Water flows in and out of the river- and rivers are teeming with life, and they sustain life for the creatures that live around them. Reservoirs, however, are still- no water flows out, and therefore no fresh water flows in. Reservoirs tend to be stagnant. The lesson is that you must be willing to have things flow out of your life in order to allow fresh new things to flow in. The things that flow out can be of 2 types- things that are old and useless, but also things that are good which can be passed on to someone else. Make sense? You can see where I’m going with this- Our UFO’s can be a symbol and symptom of how we live our lives. –Do I still love this? –Am I willing to put in the time and energy it will require to get it done? –Am I willing to forego starting something new until I finish this? –Can I honestly say that I will work on this in the next 6 to 12 months and commit to getting it done- or am I just lying/kidding/making excuses to myself????? –I really liked it when I started it, but now my tastes/decor have changed. –The fabric cost so much money. –I’m not happy with my workmanship, but my work is much better now, and maybe I can “fix” it. –The reason/event that I had started it for has now long past (did the couple who were the intended recipients of that fabulous Wedding Ring quilt just celebrate their 10th wedding anniversary???) Now I’m aggravated with myself for letting it go unfinished, so I want to “prove” to myself that I can get it done. –I still think/hope I’ll finish it someday. Or pass the unfinished quilt top down to my children/grandchildren- because even though I didn’t want to finish it, I’m sure that they will want to!!!!! –What in the world would I do with this project if I don’t finish it? I can’t bear to just throw it in the trash. –Can you think of some other reasons??? Do you feel like those unfinished projects are just hanging over your head, keeping you in a state of limbo, unable to move forward?? I have a project that is really hanging over me… every time I see it or think about it, I get anxious. It’s a wedding quilt that I started for my daughter over 5 years ago. She has been married for 4 1/2 years. Sometimes, she would ask about the quilt, and I would cringe and not know what to say!!! Here’s what happened- I designed this gorgeous quilt just for her and my son-in-law. The design was to be a surprise and I designed intricate embroidery and applique blocks that reflected them and the things that they love. I completed many of the blocks, including the embroidery…. And THEN I discovered that the embroidery thread had run on a few of the blocks. So, I didn’t work on it anymore because I felt STUCK- do I finish it and tell her to NEVER wash it or get it wet? Should I start over? Throw it away??? So, last week I was honest with her and told her exactly what had happened and why I hadn’t worked on it in such a long time. We decided that some time soon, we would sit down together and go through the basket of blocks, and decide what to do with them. Now, dear ones, I am going to give you permission to let some of these things go! Life changes and you can’t make room for new good stuff (I’m speaking both literally and metaphorically here) if you are “plugged up” with old stuff. Remember that analogy above about the river and reservoir. Another saying that helps me keep my priorities about “my stuff” is this: “Things serve us, we do not serve things.” If you feel like you are serving a thing instead of the other way around, it’s time to take a closer look at what’s going on. 1) Yes, I love this, and I can’t wait to work on it again. I can definitely commit to finishing this in the next 6-12 months. 3) I’ll never finish this, but someone else might. It’s in pretty good shape, and it’s definitely salvageable. The answer about numbers 1 and 4 are easy- keep what you love, and throw away what is not salvageable. If you can’t bear to throw things away, just put the things in a bag, seal it up, and ask someone else to do the dirty work of putting it in the trash for you. Leave the house if you need to. Or, if you’re afraid that you’ll go raid the trash can and drag the stuff back in later, ask them to drive the bag somewhere else to dispose of it. I know this sounds silly- but we can become emotionally attached to stuff (especially stuff that we’ve made- it represents our time and energy and creativity.) Sometimes, you just need help with this final step. But I guarantee that afterwards you will feel FREE and energized and really excited to work on those projects that you LOVE. Because life is too short to spend precious time working on stuff that you don’t love, right??? OK- get to work on that assignment! In my next post, I’ll give you a few ideas about what to do with the stuff that falls into categories 2 and 3. This article was posted in Featured, Inspiration & Encouragement, Sewing & Quilting, Sewing/Quilting Patterns. Bookmark the permalink. Follow comments with the RSS feed for this post.Post a Comment or leave a trackback: Trackback URL. You are so very right…we get bogged down with UFO’s. I, too, have been cleaning and sorting my sewing room and I know have two tubs of things I am no longer interested in. Going to try to sell some unused fabric and the rest will be donated to the church for their use in mission quilts. By the way, I am sure most of us would be delighted to have your UFO that you are no longer interested in. (Especially if it was the piece with the hearts)(My birthday is 02/14 – hint, hint!!) Why not have a drawing!! I’ve been cleaning and sorting also. The old UFO’s are easy to dispose of. But the ever growing piles of scraps, not so easy. I save every little piece thinking that someday I’ll make a masterpiece from all the tiny scraps. 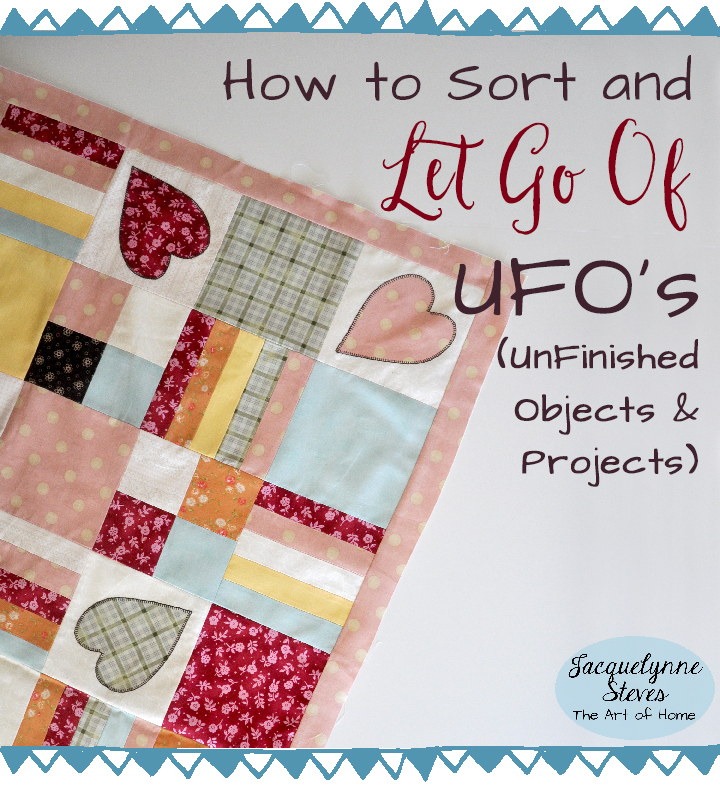 Yes Lea Anne, I have the same problem with the scraps – not the UFO’s I just hang onto them! I need to get brave and follow Jacquelynne’s advice!! But the scraps are so pretty and it seems such a waste to throw them out. I don’t actually like working with really small quilt blocks or really small pieces of fabric but that still doesn’t stop me from hoarding them! As I really enjoy applique I also use that as an excuse to keep scraps!! Hmmm – don’t know what to do. Jacquelynne this is a very thought provoking post. Thank you. For those of you that save scraps and don’t know what to do with them why don’t you put them in a zip lock bag (or 2) and donate them to your local thrift store? People buy them for lots of different projects (crumb cake blocks, stuffing for stuffed animals, etc).This will get them out of your sewing room, and help others at the same time. A MI me pasa lo mismo que a usted! que terrible! You are so right, but I find myself digging in my heels and resisting. I hope these posts stay up a while, I think I will need to read and reread to get with the program. Spent money is my biggest problem. The rest is not liking to do the backing/finishing part, AND I even have backings for most. I do well with a goal, so maybe the threat of having to toss out “money” will be a good goal to do the finishing of these. Hi Dino, the ‘spent money’ is a real problem for me as well – I feel so guilty if I get rid of something that cost more than a token amount of money. I don’t have a job so I think how many hours my husband worked so I could buy the fabric. You’d think this would spur me on to complete my UFO’s but it doesn’t. Unlike you though, I have do have lots of trouble with goals. Recently I’ve learnt that it’s because I don’t write down the steps I need to take or have a timeframe worked out. So my ‘goal’ this year is to try and formalise what it is I’m aiming to do. Maybe then I will get at least some of my UFO’s finished!!! 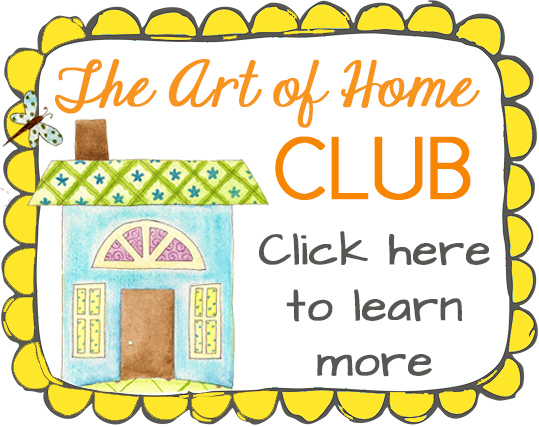 Plus I’m in the “Art of Home Club” and I really want to make some of the great projects that Jacquelynne has designed. I don’t want them to become UFO’s either!!! The post will be there forever (or for as long as my website is there!) I’m glad you found it helpful! You are talking straight to me here. I am my mothers daughter and I inherited her “problem”. I don’t want my life to be defined by the trash I leave behind but by finished projects that I and my family will be proud of because I put her heart and love in them. I can’t wait for ideas for the 2 and 3 UFO’s that DO drag me down. I do more quilting in my head than I do with these old 62 year old hands. Thank you for the IMake a Splash Aurifil and Splash of Color Book I won today. Hoping you got my reply email from my godblessamerica.jan AT icloud DOT com email box. Off o get started on my # 1 UFO’s and throw out my #4’s. This is me!! I, too, inherited all my mother’s ‘stuff. And just like her (which I’ve sworn I would never be like! ), I cannot bring myself to get rid if anything because ‘somebody else will waste it, or not appreciate it (my mother’s words still living on thru me!). Slowly I have donated some things to a local charity which I seem to feel okay with. I have even tried to give some to my daughter – who says “No thanks, I want to use new, fun fabric”. The things we let control and influence us, my oh my – I need a fabric therapist!! OMG! I am stuck in a reservoir. This analogy is great. At the end of the street, is a drain. It has a “pile” of debris, — just how I see all the scraps, UFO’s, books, printed patterns, documents and images on three computers, the mess I have made trying to organize. Instead of a neat one room, I am now a mess in three rooms. (wonderful husband, never says a word) I am guilty of 1, 2, 3, 4 reasons. I have given away several bags to “someone in need” to build her stash. She was happy. Looks like I need to do more of this. I have a 5 reason. I get stuck on something I can’t do well and I just quit. I buy a tool that I can’t use right. I buy a new sewing machine and the dealer goes out of business. And 6, health, I broke two fingers (you really need those two fingers), I lost my eye sight in one eye. So relearning took time. I am lucky. Stash, room, expensive machine, fingers healed, and I can use this one eye pretty good. FLOWIMG RIVERS or “little streams” are on the horizon. 72 degrees here is WV today also. I won the Jackie Kunkel prize. Not your wonderful fabric. I get so confused in my old age. It must be the UFO’s I drowning under. Carol- I love “little streams!” You don’t have to do it all at once!! How timely this post is! I am working on a UFO and am enjoying it. Wondering why I didn’t finish it sooner. However I have others I just don’t like anymore. Just need to box in up and ship to Quilts for Kids. Thanks for the timely push. This is a great article that can work with many aspects of life. Absolutely! That’s why I love the river/reservoir analogy. Thank you or the neat Keep or Throw away post. My husband and I are hoping to move to a smaller house in the next few months and I have been going through my sewing room. Oh my, what an eye opener, what was I thinking. I have so much “stuff” it is embarrassing. Just reading your article has given me hope, I have packed away so much and it is in a storage unit but I have printed out your article and will check it over again when we unpack at the “new” house Thank you and love getting your up beat newsletter. I’m so glad you found it helpful, Denise! Best wishes on your move! 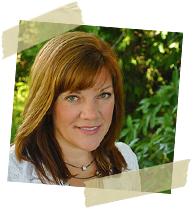 Hi Joy, just hopped over to your blog and had a quick look at your UFO goal for 2017 – brilliant!! I think I have about 20 UFO’s but as my sewing room is a bit messy I’ve probably got more lurking in piles of other stuff! !I’d like to join in but have only just started working on making a blog so much to learn! !Trying to complete at Certificate IV as well at the moment so sewing time is about zero!! I’m in NSW. Thank you so much, I really needed this article. I’m looking forward to your next post. Your honest forthright approach is refreshing. Thank you for giving that heartfelt permission its ok. Looking forward to more posts and comments. Dianne, sometimes you need “permission” from an outside source to feel at peace with it. Glad you found it helpful. Loved the article. I took on all of my mother’s UFO’s after her death. Just felt it was what I needed to do. I had spent 3 months at her bedside in ICU, I was the only one who could tell what she was trying to say. Somehow I have found comfort in doing all of this though it’s taken a long time to get to a place where I could. It’s been 10 years since she passed, and I feel happy and at peace when I am sewing. It’s as if she is right there with me when I am sewing. Joni, what a lovely story. Working on your mother’s projects must be comforting. For you, or anyone else in a similar situation, I give permission to just choose the projects that you love the best to work on. You are not obligated to finish everything, and I’m sure your mother would be fine with you “releasing” some of the unfinished projects. No one wants to leave a burden to a loved one. Hugs!! Alfie looks so cute in a guilty sort of way!!!! What a sweetie!! I am attempting to do the same. Luckily the first weekend in March is a quilt retreat that I go to every year and we have a ‘scrap’ table. Everyone brings UFO’s, scrap fabric, magazines, etc. and it goes on this table. Usually most of it is gone before the end of the weekend! I actually got a finished quilt top that was ‘ugly’ but finished it and sent it off to college with my daughter for her common room. Told her I didn’t care if it was ruined, stolen, or thrown up on. It was ugly and I didn’t put a lot of time and effort into it. Of course she brought it back home upon graduation and she loves it. Lots of memories she says! One woman’s trash is another woman’s treasure! That is absolutely true, Patricia! How delightful that the “ugly” quilt was loved by your daughter- no quilt is ugly as long as it’s loved!!! This couldn’t be more timely for me!! I just came home from a retreat where I dragged a UFO from 11 years ago. It had been to the retreat several times but never came out of the box till this weekend. I FINISHED IT ! The full size winning hand quilt top will be quilted and given to my brother in the next few months. What a great feeling it was to have it done. I didn’t expect to be so elated!! Woo hoo!! Isn’t it freeing! Congratulations! Great post! For those of you that can’t seem to let go of something, because of the cost or time that you have already put into the project, find a church or organization that would love to have, so they can teach someone the skills. The church that I grew up in has a clothes closet and those items that are donated that have either a stain or need some mending, they package those items up and give to an organization that teaches sewing to those in the Appalachian Mountains. Also for those of you that need to have a list to keep you on track, don’t make this long list of everything, for this will in its self discourage you. What you need to do is create categories and then have subcategories underneath them. You then break out your To Do List as to the importance of those items and make a realistic goal for each day. Ten minutes before the end of the day go back to your list and see what is left to be down, then you prepare your To Do List for the next day just like you did before. Review your list first thing in the morning and then proceed. Make sure to include in your daily To D List not just those artistic endeavors you want to accomplish, but also your everyday chores and/or appointments. My daughter prepares a weekly schedule of her time in order for her to accomplish all that she has to do in not only your 9-5 job, but her writing career as well. Mil gracias por la idea de ir dia a dia… yo me hice la lista despues de revisar mis lindas cajas donde guardo lo que no termino para no ver la realidad! pero cada vez que veo la lista sufro! Excelente idea ir dia a dia asi no se tiene mala conciescia! Great post. Every quilter has to save every single scrap for another project. 24 hrs past and 365 days fly by and we are where we started off still hoarding. I do have UFO s I am working on one piece a month style as a deadline. so far i have been successful completing them as per target. Poor health meant coming back to quilting with a new project as I forgot what I was working on before that. Holidays are another reason for this same story repeat telecast. Don’t know how many UFO’s are lying around for a 17 yrs old journey as a quilter. Love every single scrap and consistently working with them. I did share scraps and fabrics with friends at my bee. I put them in bags and asked them to help themselves. After everybody had their picks one lady took those and made 3 quilts out of them for her beds. She hand pieced, hand quilted them and the speed she worked and completed them was like a lightening bolt to us who were struggling. This lady loved every scrap and is still a great inspiration to all of us. Today our bee members are scattered around the world and we still have a virtual bee online sometimes. now I leave my scraps on the guild free table and those who pick them up donate a little cash to our charity box. I firmly believe in charity and do not like dumping fabric in garbage bins. some pieces maybe ugly today but when we picked them up they were pretty. so i chop them up to make strips and squares and make runners or anything that catches my fancy. that ugly fabric loses its uggliness by the time it is chopped to a size and no trace left behind or memory of its origins. as long as u consistently organize and use them up. have a great day. It’s great that you still have those quilting bee friends, Wilma! Great idea to swap scraps! I am in the process of cleaning out my mothers house. She was an avid quilter but unfortunately she was a reservoir. I am a quilter as well and have accumulated a lot myself. In January I took a bunch of fabric that I knew I was over to our guilds annual retreat and shared with my fellow guild members. This week I have invited them in to purchase my moms stash for a very low token fee and some were happy to take advantage of the bargains. I plan to donate the remainder to a group that does charity work. Just because you are over it doesn’t mean it has to go to waste and you needn’t feel guilty because the truth is if you aren’t using it then it is being wasted so move it along and be free! True! If you aren’t using it, it is already being wasted! So might as well “let it go” and be free! Enjoyed your article and agree with most BUT the landfills are overflowing….so why not try what our guild does – we have a Freebie Table and scraps, magazines, UFO projects, notions etc get dropped off …then there is a “feeding frenzy ‘”!!! Whatever is left at end of meeting gets boxed up for a charity. Tomorrow is the start of Lent and the,start of 40 days – forty bags! Some of those bags will be in my sewing room or should I actually call it sewing collection room! Good luck to all of us in rediscovering some wonderful things we have forgotten! Love your new blocks on your sight. Wish I could finish my UFO’s but it is not possible. Had a boxer black-out syncope. Was walking the dogs. Street. Was in the Hospital 2 days for so many test. Broke my right hand and wrist so it be a long time before I can get back to quilting and crocheting.. Your blocks are gorgeous and your materials too. Hope when I get my very large cast off back to quilting. I knew where you were going with today’s blog within a few seconds of seeing the title. And, I laughed! I did not do a 2016 quilt along because I was sort of catching up. Of course, I didn’t catch up and decided to join the Splendid Sampler. The Sampler is now on my UFO list. This year I did join the Quilter’s UFO group and have 27 items – mostly because I have split tops from quilting. Most of my tops are large ones and take some time to finish. But the reason I’m hopping in is that I’ve found I’m doing a lot more sewing with “the list”. We get assigned to complete an item each month. When that UFO is completed, I just move on to Splendid Sampler and/or working on a quick finish new project or another UFO. It’s great!!!! Querida amiga quiltera mil gracias por tu articulo que he compartido con amigas que tienen el mismo problema! la cuestion es que tenemos mas fantasia que tiempo para realizar todas nuestras maravillosas ideas!Mi esposo ha estado de viaje desde enero y regresa en abril! yo feliz sola entretenida en ordenar mis cosas y a la semana tenia la casa como campo de batalla! ahora recien las cosas van recuperando su lugar y otras que no sabia que hacer en una bolsa que aun no he tirado! los maravillosos UFO estan clasificados pero alli en una caja hermosisima semi cerrada en la cocina (asi la veo todos los dias) porque tengo que darme fuerzas y animo! pues bien escribi una lista! y he logrado terminar 4 de 29 pero eran los trabajos mas pequeños y faciles Pero esa lista me da mucha ansiedad! Ahora leyendo este maravilloso articulo leia los comentarios y una amiga quiltera le escribia a usted que ella hace un plan diario y esto si me ayudara.Muy buena idea. decidir dia a dia la cantidad de trabajo y creo que lo ideal es hacer un poco no mucho con los ufo dia a dia para poder continuar con las cosas nuevas que van surgiendo para no quedarnos pegada en el pasado! tambien trabajar con el futuro… yo me encuentro con amigas cada lunes y hacemos cosas nuevas… pero creo que es una buena idea tener por lo menos un lunes al mes para trabajar ufo o vender o regalar cosas que se acumulan! muy buenas metaforas del rio y el embalse y tambien que las cosas son para servir y no servir a las cosas. Mil gracias por tu maravillosa generosidad de compartir tus conocimientos, y me doy el atrevimiento de llamarte amiga quiltera. Felicidades y la lucha continua! You have no idea how I needed this post. I have many UFO’s that I just don’t want to finish. I was always taught not to waste things, so it has been difficult to let them go. After reading your ideas on how to sort them, I think I am ready to let things go. Thank you so very much. Oh Betty, you’ve caught me! The quilt shown in the above photo is still in my UFO pile!! UFO s quilts can be cut up and bound with a zig-zag stitch to make pet shelter comfort for dogs and cats, check with your local shelters to see if they accept them. Alot do and appreciate. Thank you so much for putting this plan into words. Like all of us creative people, I was holding onto a lot of UFOs and other items that I thought “I will get to this soon and finish/start it”. A few months ago I was cleaning up my studio and came across a ton of UFOs and fabric that is now totally outdated. Some of them were panels and pre-printed patterns to make a vest and an apron. I loved the fabric but the style for vests like that are long gone and I did not need another apron. I forced myself to think hard on what to do. My art teacher background brain came through and I ironed on wonder under on the back of the graphic areas of these UFOs and now have iron-ons for that perfect quilt to be made in the future. In face the apron was a halloween design and it is now a table runner for the kitchen island. There are other ways to use “old” fabric and patterns. Thanks for the push to let go. Thanks for saying it for me “let someone else get rid of it for me”. I have to because I do not have the room to keep all these quilts any longer. My grown children do not want anymore and I have no more space to hang anything. I did them and it’s done. I’m in the same boat. I have a lot of UFOs and a few are really great quilts and must be finished. However, I have a lot of runners not finished. The runners were supposed to be big quilts, but I felt pressed for time and made runners instead. I need to get organized right away!!! OMG I’m so greatful for this post….. I haven’t sorted anything yet but already feeling better. Thank you. I may be a little late to the blog but this post is very pertinent to our lives and not just to UFOs. I had to share the beginning about the reservoir analogy- I am hoping the people who should read it and compare it to their lives will. 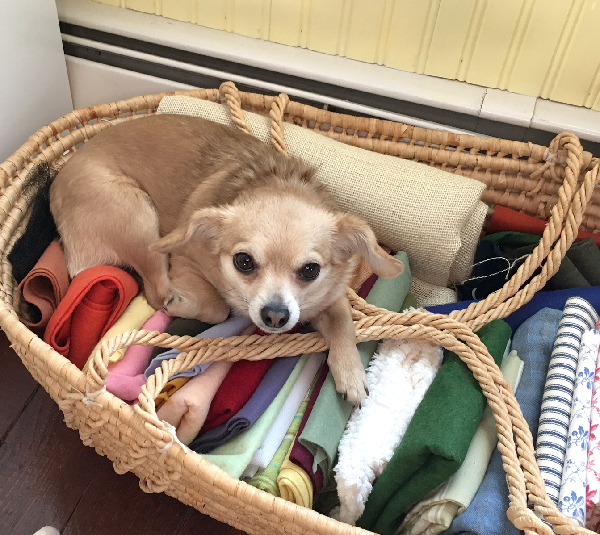 I don’t have a lot of UFOs but I do have a lot of fabric stash that I periodically go through and if I have had it for awhile I donate it to a dog rescue thrift store. It makes me feel better and gives me room for more fabric!! !